A tub to shower conversion is one of the least expensive ways to turn your bathtub into a walk in shower. Tub to shower conversion can reduce the possibility of slips and falls while getting in and out of the tub by providing access to the bathtub in a safe and assured manner. A safer entry into your bathtub or shower area has never been easier! Because tub to shower conversions simply convert your existing tub; you will not have the down time or expense associated with typical remodeling or with replacing your tub with a walk-in shower. No demolition, no tub removal, no damage and no need to alter your existing tub surround or tile. Therefore, you will save thousands of dollars in remodeling costs. Tub to Shower Conversion Completed in less than a day! The tub to shower conversion process is also extremely quick! Complete the entire process within a few hours. The new easily accessible shower is available for use 24 hours after completion of the installation. A section of the tub rail (the part that you generally step over) will need to be cut out so you can walk through that portion of the tub. This will assist seniors and or caregivers in your home by removing the biggest barrier in the bath tub area. Though fiberglass, steel and cast iron tubs are ideal for the tub to shower conversions; cast iron tub sections will be more difficult to cut out. The step through kit includes a full list of tools and instructions. 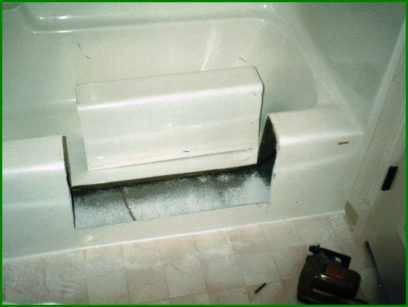 You should have some basic technical and home repair experience to complete a tub to shower conversion. Cut and remove the section of the tub for the tub to shower conversion access. Then cut the step through insert to match the removed section. The insert will then fit like a saddle over the removed portion to finish the tub to shower conversion. Purchase kits online or call us to place an order.